1. No exposed bulbs. Since the light hangs at about eye height, and we have to walk through this room to get to our kitchen, we didn't want to be blinded by exposed bulbs like we were with the previous light fixture that hung here. This ruled out a lot of the really beautiful fixtures we liked, but it was necessary. 2. An 'open' sight line. Again, because it's at eye level, we thought having an enclosed shade (like a drum shade or a long rectangular fabric shade) would block the light from the front windows and make the room feel smaller since you wouldn't be able to see it all. So with those two 'rules' we started looking for the right fixture. 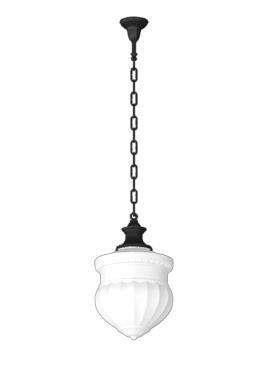 I love Restoration Hardware light fixtures and we put several of them in our house throughout the renovation (in the kitchen and kids' bathroom). Before we moved out I had fallen in love with a candle looking chandelier from there...but cha-ching...it's almost $900. That was the fixture in the house when we moved in. Not my favorite. I seriously love this fixture and it began my obsession with the store too. Remember when we went to visit it in Seattle? They thought we were crazy fans. And Williams Sonoma's purchase of the brand made me buy stock in them. Good move! This fixture was cheaper than the Restoration Hardware one (it's $510-ish) but I wanted to put in TWO over the dining table. That sadly wasn't going to happen. I actually have another spot in my house in mind for this light if we ever get around to finishing everything else (I'm not holding my breath). But it wasn't meant to be for the dining room. 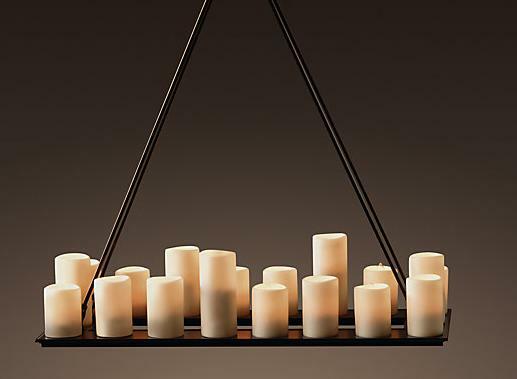 After much research, we settled on a light from Overstock and we like it. I don't remember the exact cost but it was under $200 and it met our list of requirements. No exposed bulbs, check. Open feeling, check. We wish the glass pieces were more white (we're not fans of yellow toned lights), but when it's on it gives plenty of light and we're happy with it. We're also pretty thrilled with the additional light switches we put in during the renovation. We used to only have one switch in the dining room. You had to cross the entire room to get to it. Now we have THREE switches and the light is on a dimmer so we can control how bright it is. We also added 4 recessed lights (two on each side of the room) for some ambient light and they are on dimmers as well.